Postwar Bogart a test pilot? Seems ill-advised, or maybe armed forces needy for guinea pigs did send up hard drink/chain smokers to do the job of men thirty years younger. Did Bogie balk? He split w/Warners not long after, path littered by scripts better than Chain Lightning that he'd nix out of hand (including Trouble Along The Way and The System, latter turning out fine with pinch-hitter Frank Lovejoy). HB spent hours in mock-up aircraft against process sky, having to realize through it all that Chain Lightning would do his career no good. He'd had a string of clucks, in fact. 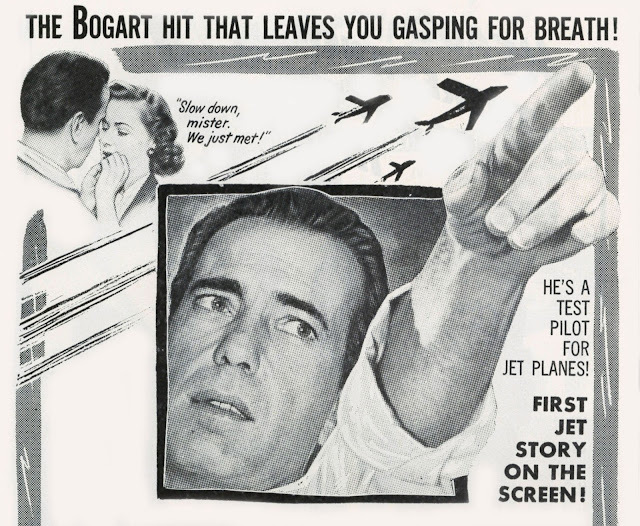 None of Bogart's own Santana productions amounted to much, including now-lauded In A Lonely Place, a flop at the time. The African Queen came not a moment too soon to airlift Bogart from stalled vehicles like Chain Lightning. Warners had adopted a spend-less policy from 1948. You could see cuts applied to Key Largo and ones thereafter. This hurt all of product, but was essential to keeping gates open in face of reduced theatre attendance and families barbecuing or playing outdoor sport instead of picture-going. Here is startling statistic I came across in a book by Gilbert Seldes, The Great Audience, published in 1950: "In 1948, the American people spent more money on equipment for fishing than they did at the movie box-offices, on hunting and bowling they spent a billion and a half dollars, almost equally divided, which again is more than they spent to see the movies; the once-exclusive pastimes, golf and motor-boating, were so popular that the amount spent on them roughly equaled the movies' take." Seldes argued that when viewing sports, "the spectator sees a contest," where "surprises are greater than they can possibly be in the formulas of the movies." So there is basis, neatly summed up, for friends and former classmates preferring ball play to show-going. Would Greenbriar be a hotter Web address if it concentrated on pigskin and hoop rallies? Most assuredly --- yes. 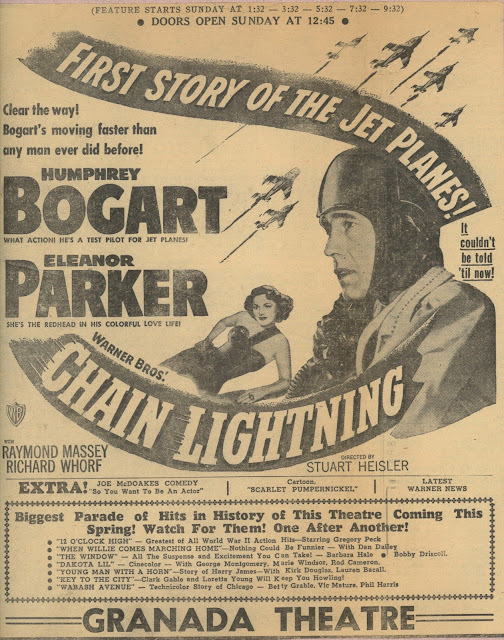 Back to Chain Lightning, or any late 40/50's output of hobbling Hollywood. Seldes talked much of folks grown out of movies by the time they turned twenty. Is that still true, even more so true? I read of average buyer for advance tickets to the recent Star Wars being fifty-years old and male. That would be nostalgia's crowd, of course, ones carried away in 1977 and wanting to visit their magic place again. Many of us like movies precisely because most are same old-same old, comfy as well-worn shoes. I saw Chain Lightning yesterday (a Warner Archive DVD) and wondered if anyone else in the world might be doing the same (and if so, why?). 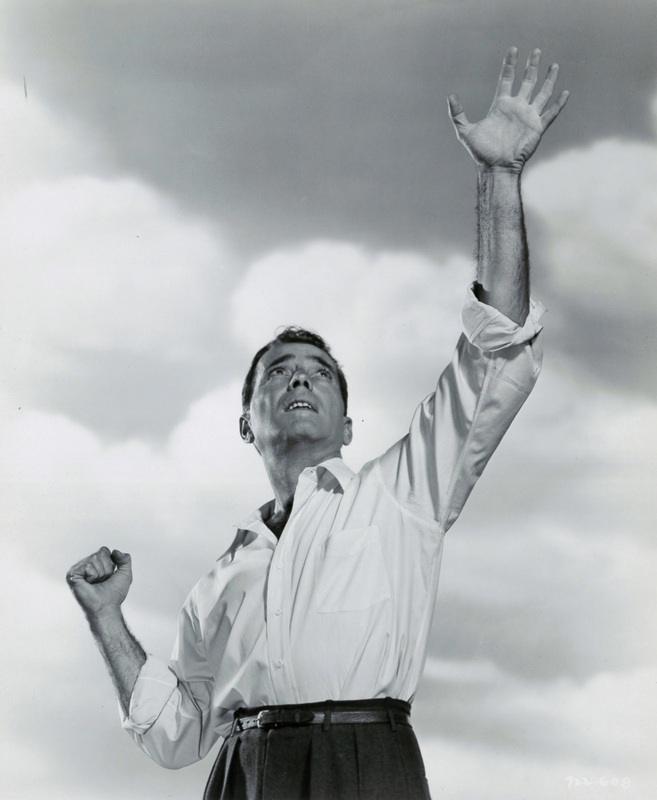 Outside of value as a time capsule, and barometer of Bogart "far from his best" (to quote capsule reviewing), where is value in Chain Lightning? To civilians and the young, probably none, but isn't that the fate of all oldies, and almost as soon as they're off a production line? Top Gun (1986) is thirty-six years "newer" than Chain Lightning, treats a same jet-age in up-to-minute terms, but like its precursor, is, in John Wayne Alamo parlance, "dead as a beaver hat" to contemporary viewership. Enough of chilled reality's splash. 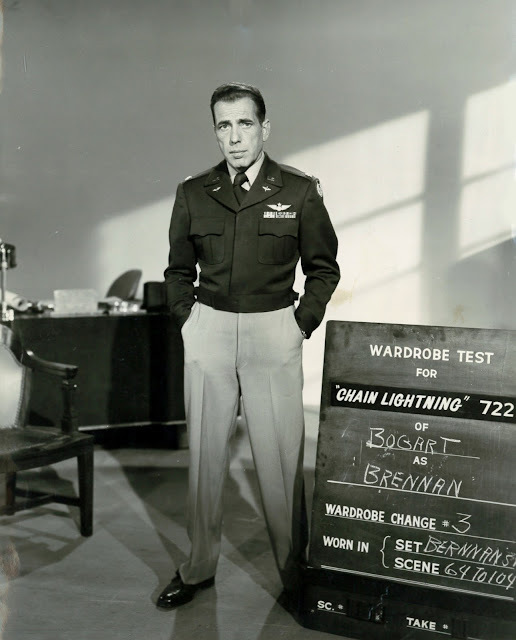 I enjoyed Chain Lightning and hope to again before achieving ultimate lift-out like Bogie in his "Buck Rogers rig" (what dialogue calls flight suits). Early jets were like science-fiction. There's a nice flashback to WWII where HB and crew sight a rocket-powered German craft entering a dogfight against allied bombers, uneasy remind that, given a few more months, the Axis might have turned tides in the air. It's here we get first whiff of Warner economies, all of combat borrowed off actuality footage and a mismatch to studio fakery. Warners spent $1.4 million on Chain Lightning's negative. It got back $1.6 in domestic rentals. Without foreign revenue (another $890K), it would have lost money. This is how serious the depressed market was. 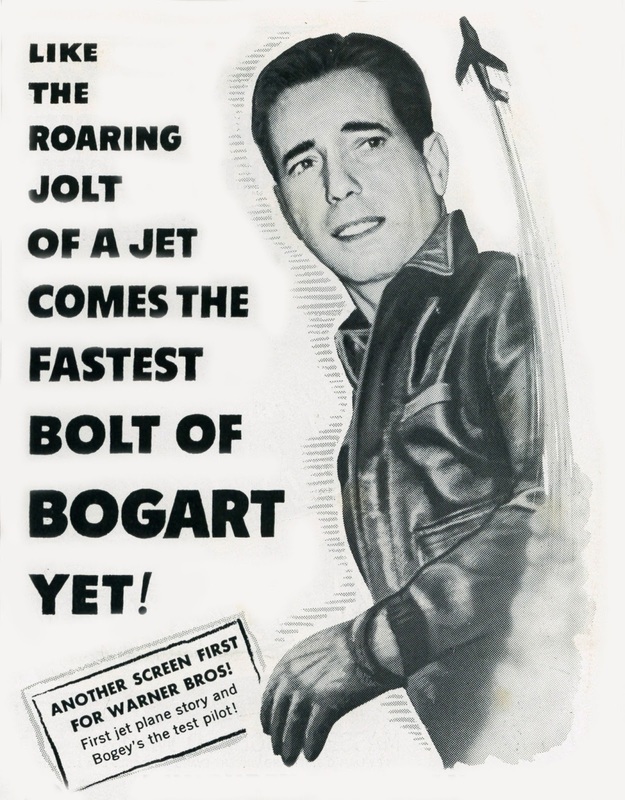 Bogart not long before was a guaranteed mop-up every time. Now they'd squeeze pennies even on his vehicles. Chain Lightning is best seen from that sympathetic viewpoint. It was simply, and for its time, about the best WB could do on behalf of contract talent (further sampling: Gary Cooper in Dallas, Flynn in Montana, Joan Crawford in The Damned Don't Cry). That's quite a pose by Bogie. Looks like he's auditioning for Elmer Gantry. When the TNT channel was launched in Latin America in the early 90s, instead of lousy and unwatchable content, they would play movies from the Turner library. 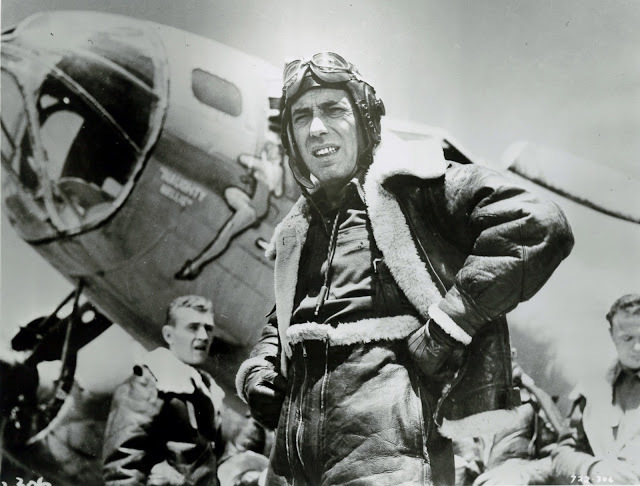 This Humphrey Bogart vehicle was among the many of those films that would frequently surface and I saw it there. It is no great film but just OK. Yet, I would never pay any money to have it on video. Many movies, products like TOP GUN (which I curiously saw on a broadcasting station around the same time) were quite overrated at the time. That is typical, and it is also typical that many of them enter a cable TV rotation becoming extremely available. Seeing these films in these conditions they become rather routine productions and not really memorable. The real memorable movies are those that managed to overcome this kind of overexposure and still gather interest. The last 40 or 30 years produced no films I would spend time revisiting. When I go back to the older films and the classics I have to say yes, I can see them again. But the other movies produced at the same time are not appealing enough to spend time and specially money on them. Love that ad and its all-WB show! Did you cue up the McDoakes comedy and Daffy cartoon (both readily available) to recreate the full experience? Say, this must have been Bad Bogey weekend as we watched THE TWO MRS.CARROLLS, where Bogey and Barbara Stanwyck do their darndest in parts that seem tailor-made for Vincent Price and Joan Fontaine, is Peter Godfrey in the Directors Chair a warning sign on too-many late-40's Warner Bros pictures or what? Bogey is just not the tortured-artist type, though he does manage creepy-psycho quite easily in the last 20 minutes (shades of the future Fred C. Dobbs and Captain Queeg in his performance),but I was thinking that with CARROLLS and CHAIN LIGHTNING outweighing the TREASURE OF SIERRA MADRE's and KEY LARGO's in the scripts Jack Warner was sending him by this time, no wonder Bogie wanted out. THE ENFORCER was a bit better, but too little too late. And who buys Stanwyck as withering suffering damsel in distress? This is a woman who'd slam dunk a psycho-Bogey first time he got a bit twitchy and bury him in the back yard, never bought her in SORRY WRONG NUMBER either, I say both leads are working off a contract caring little what picture Warners put them in. This isn't the type of film Mark Hellinger produces well either. Did anyone involved really want to make this film? 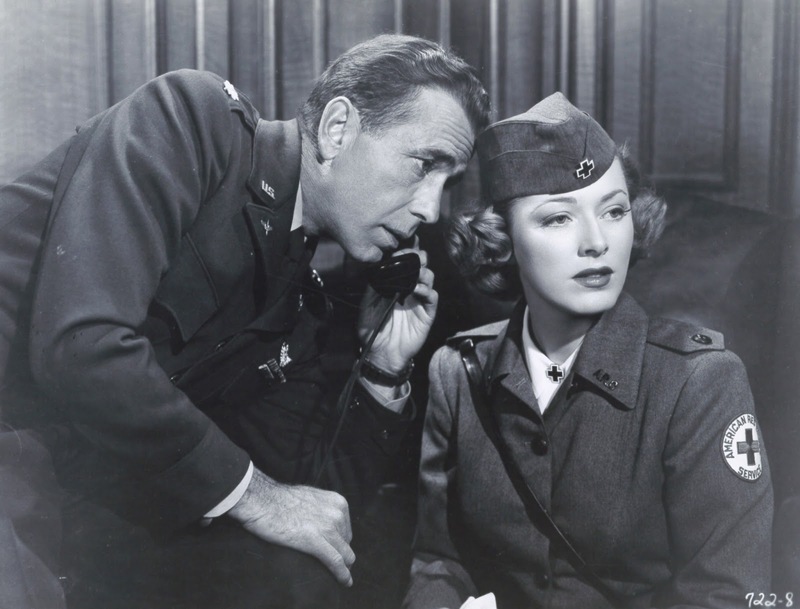 Hey Richard: As to anyone wanting to make "The Two Mrs. Carrolls," I remember one of the bios said Bogart was OK doing this one because he had just married Bacall and was in a good enough general mood to tolerate another bad vehicle. But yes, HB as a tortured artist is sure enough spectacular miscasting. With Bogie, either title would work! I was pleased to see this pop up today, John, as there used to be a local deli where I took my family often, and it preferred to decorate the walls with vintage theater and movie posters. And, one which always intrigued me was---yup (as Cooper always supposedly said, and DID often say! 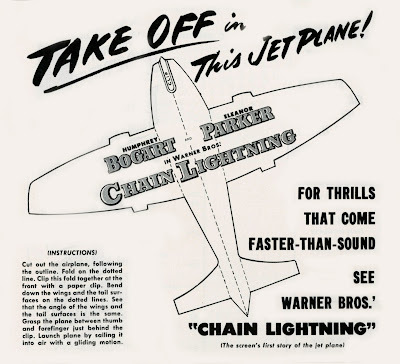 ), it was "Chain Lightning"! It was similar to the one you have printed near the bottom, but formatted in such a way that Bogie's entire pose was reproduced, the 'pointing up' one, and though it didn't make a hell of a lot of sense, really, it had a dynamic feeling, and always drew my eye when I'd to to this restaurant. It makes a lot more sense now, as your text clarifies the 'up' part sufficiently! I have friends who don't care for the admittedly somewhat-similar WB ad art of the '40s, but I personally love it. Because of its streamlined quality, it still seems modern where posters out of studios like Fox or MGM---really, most of the others---seem stodgy and like your grandmother's parlor, comparatively. Could be a bias for seeing the performers stripped-in, via photography, versus the often dicey illustrations on other studio's ad art. Experts in this area would know who I'm about to cite, but the guy who painted the posters for RKO had an uncanny knack for photographic realism (I'm imaging some Mitchum vehicles in my mind's eye), but sometimes the posters just barely resembled the actual stars. Whoever ran WB's promotional art then obviously felt the public should see the stars, themselves, and accompanied their images with zippy, 'modern'-looking, minimal graphic flourishes and simple, punchy fonts. That is no doubt why they still look airy and smart, today---to me, at least. Talk about sub-trivia to trivia! But, what else are we living for? Now, maybe someday I'll actually SEE "Chain Lightning"! I believe, could they compare on equal terms with the OUTSTANDING WARNER BROS. PRODUCT of ANY ERA. I'VE ALWAYS HELD AN ACQUIRED ADMIRATION FOR ALL WARNER BROS. PICTURES, IN ABSOLUTE AWE OF EVERY DEPARTMENT THERE. EACH CONTRIBUTING THEIR PART WITH THE EXPECTED, OUTSTANDING COAT OF QUALITY. EACH PRODUCTION STAMPED,ON THE SCREEN HAVING THAT INSTANTLY RECOGNIZED WB FORMULA AND STYLE. ALL OF THIS- A VERY SOOTHING FORMULA, INDEED; FOR ANY ANXIETIES THAT ONE MIGHT HAVE AS A VIEWER- AWAITING-- FOUND THE USUAL RELIEF, AS THE WARNER BROS. LOGO BACKED BY MAX STEINER'S THUNDERING MUSIC-- CAME ONTO THE SCREEN. THEN, FOR THIS BOY, EVERYTHING THAT FOLLOWED THAT MOMENT ON THE SCREEN WOULD BE (and still is)JUST-- FINE!!. (2017).